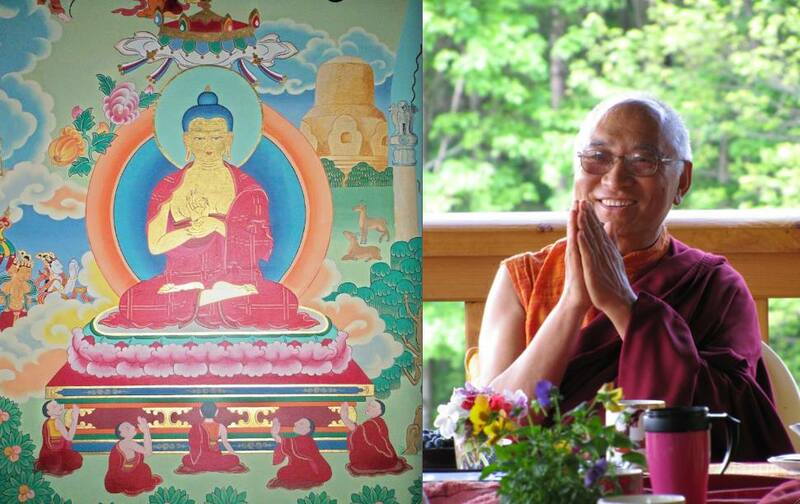 “The great masters taught that bodhisattvas are great practitioners who extend help to all sentient beings. Their help continues without stopping for aeons and aeons; they are never tired, bored or discouraged. That is why this path calls for courage. The path of the bodhisattvas is often difficult, because we deal with the needs of every sentient being. To help others can be tricky, even when we have the purest hearts. It’s not always easy for others to accept our assistance. Therefore, as bodhisattvas, we should not push others, or forcefully oppose them. We are to be skillful and help according to each individual’s readiness and capacity. Our compassion should be organic, and naturally advancing, and we should never lose our commitment and confidence. A bodhisattva never pulls back, but stays as solid as a mountain, and accepts every turbulence of samsara, every challenge that comes, every up and down. This compassion is not just for a few people, but for all beings, who are countless. The bodhisattva’s love is not restricted by groups, by regions, by borders, or by any categories whatsoever. This bodhisattva path is a joyful path that brings us happiness, and is always uplifting and reassuring. Being able to work for and help beings is not only rewarding, it also removes our obscurations. It makes us strong and assured in the midst of all this samsaric trouble. Therefore the sutras and tantras all say it is a joyful ride. “Listening, contemplating, and meditating are known as the “three wisdoms.” Each of these practices is vital to actualizing our buddha-nature and our abilities to benefit others. First, listen carefully and closely to the teachings you receive. This should encourage and inspire you to make a joyful effort. Do not simply collect teachings—look into the implications and contemplate their meaning. Then, apply them to yourself so that what you’ve received does not merely penetrate your ear and brain. Really connect with the meaning behind the instruction, take it into your heart, and reaffirm the truth of each word with your own understanding. That is known as contemplation. By deeply contemplating the teaching, you will naturally actualize the result known as meditation. Meditation will help mature what you’ve learned so that your knowledge is not simply intellectual or conceptual. Results will ripen as you grow. Although all three are indispensable, meditation is the most important. To apply these three practices, we must learn to recognize and release the tendency to indulge in distractions. This is especially true when we are first beginning, but distractions can be a serious hindrance at every stage of practice, especially during meditation. 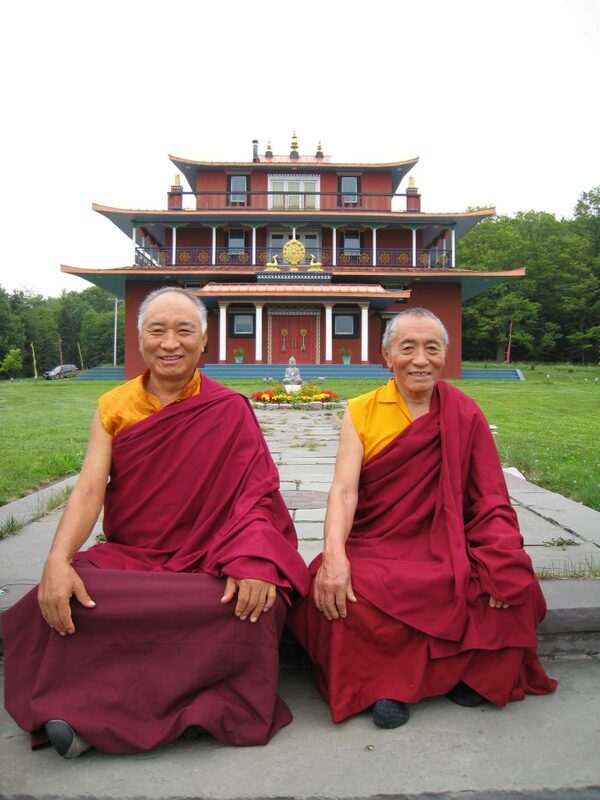 The Dzogchen teachings say, “There is no meditation. Non-distraction is the meditation.” In the Prajnaparamita teachings, Buddha Shakyamuni listed ten types of distractions that can occur during practice and prevent our progress, including conceptions of: (1) nonexistent nature, (2) existent nature, (3) exaggeration, (4) deprecation, (5) the conception of one, (6) the conception of many, (7) identity, (8) discrimination, (9) holding titles and names, and (10) conceptions of meaning. Photo of Ven. 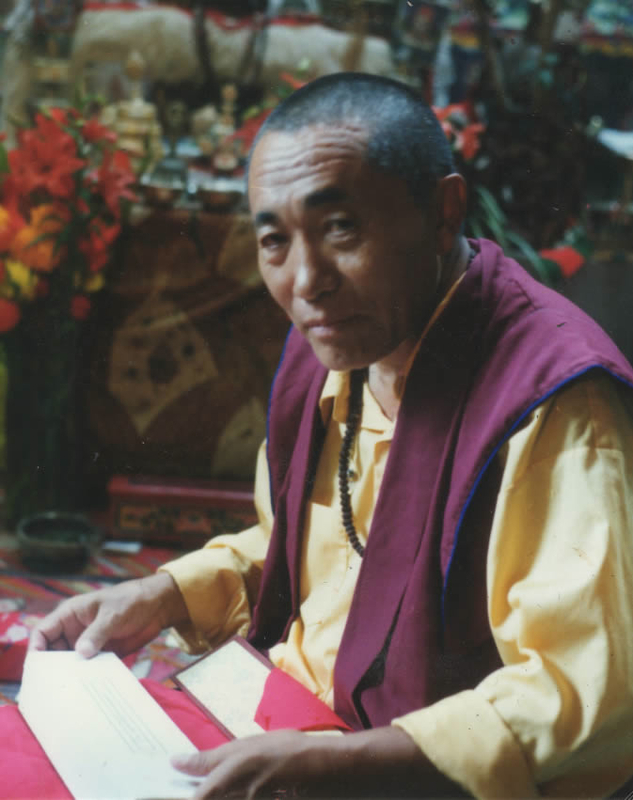 Khenchen Palden Sherab Rinpoche studying and contemplating in the 1990s. Completely subjugate your own mind. “The Buddha said that before and after practice, you should do a lot of intellectual analysis and investigation. But during practice, meditate with confidence, joy, and appreciation. Don’t spoil your meditation with lingering thoughts of, “This might be, that might be.” That is duality. If we look at this in a little more detail, it is doubt and hesitation. It is timidity. We are afraid. This is another ego trick, delaying and spoiling the time we have set aside for our meditation. How Can You Tell If Something Is Actually “Crazy Wisdom” or Just Crazy? 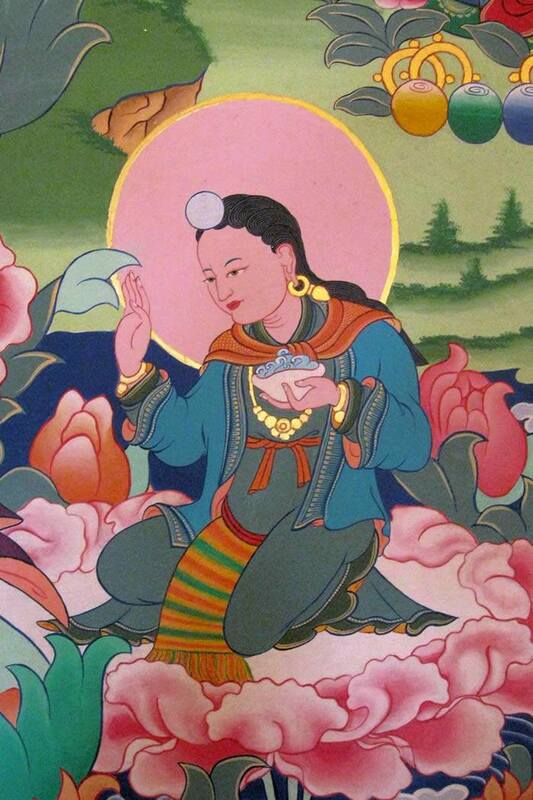 Photo of the Wisdom Dakini Yeshe Tsogyal from the Padma Samye Ling temple mural paintings. 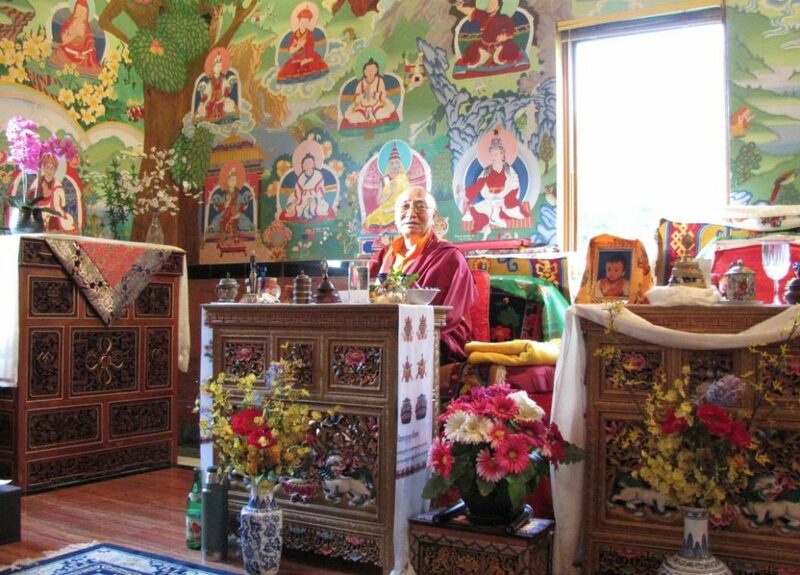 I DON’T SEE THE DOWNLOAD IN THAT ISSUE OF PEMA MANDALA — DOUBLE CHECK OLD SITE. “When we look back at the life stories of great masters, they all went through many difficulties and hardships. In some cases they hardly even had enough food to eat, clothes to wear, or decent places to stay. Yet with their courage, their commitment, and their vision, they continued to stand tall and achieved a great realization that every generation since continues to honor and appreciate. These are great messages, great teachings, great lessons, and great examples for us and for everyone. We have to make ourselves strong with the same level of courage and commitment. For example, we always say, “The Buddha reached enlightenment under the Bodhi Tree.” Of course this may seem romantic, fascinating, exciting, and almost yuppie-like, staying in the garden and all that. But realistically, it was very difficult.We never mention the mosquitoes, the rain, or the heat of India. Similarly, when Guru Padmasambhava came to Tibet, he didn’t stay in the palace of the kingdom—he stayed in the Samye Chimpu cave. Of course now everybody goes there as a pilgrimage spot, but we don’t often think about how cold, windy, or snowy it was. There were no windows, doors, or insulation. It was just a simple cave. Yeshe Tsogyal and Vimalamitra also stayed there, as well as the famous Nyingma tertons Nyangral Nyima Ozer and Guru Chokyi Wangchuk. Jigme Lingpa also stayed on the same mountain in another cave that he named the Great Secret Cave of the Lotus. These days many people go to that cave on pilgrimage, but again, it is just a very ordinary cave. Of course in Tibet sometimes caves can be very beautiful, but this cave in particular was not very comfortable. In the summertime when there was rain, it gathered a lot of moisture—it was damp and dripped water. It was also cold and partially unprotected—it was more wide open, almost like an overhanging rock. This cave is very holy and sacred, and many great masters and practitioners stayed there. Jigme Lingpa stayed there for nine years, and had visions and received blessings from Longchenpa. Longchenpa also wrote his realizations and teachings in this cave. It is such a great and blessed cave, but it is not comfortable according to the modern standards of beautiful facilities that we’re often spoiled with today. Even in the winter when there was a lot of snow and blizzards, or in the summer when there was a lot of rain, Jigme Lingpa would compose and sing beautiful songs. The weather reminded him of impermanence and how beautiful the natural display was, as it appeared and changed so many things, one after another. Milarepa also stayed in caves. During the course of his practice, Milarepa stayed in six different caves known as the Six Castles of Milarepa. Usually castles are for wealthy aristocrats, but these caves he called his six castles. Some of the caves were okay, but others were not that great looking or comfortable. These caves show us the patience, courage, and commitment of these great masters, and what it takes to practice the Dharma and reach enlightenment. These great masters were not looking for something comfortable, nor were they timid, sensitive, or fragile, making excuses all the time. They kept up their practice with courage and commitment, and that’s how they reached enlightenment. 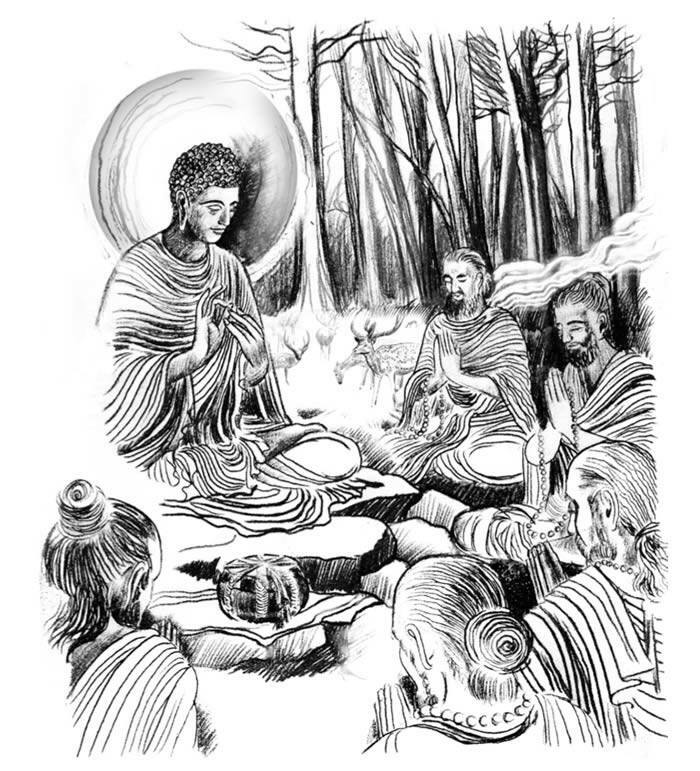 Longchenpa himself stayed in a cave after receiving the final teachings from his root teacher Kumaradza. As he went off to practice, he made a commitment to Kumaradza: “I will make offerings of my practice. I will practice and make that offering to you.” Then he went to his cave, called the Kangri Thokar Cave. Today if you go there on pilgrimage, you’ll see that it’s not a beautiful, comfortable cave. It is at a very high altitude and is not very weatherproof. Longchenpa took just one bag that he used for his cushion, mattress, and blanket—he sat on and wore the bag. He also had about ten pounds of roasted barley flour, or tsampa, and twenty-one mercury pills. He used a meditation technique to extract the essence of the mercury pills so he could live off them. That was his whole supply for three years, and he reached enlightenment there. Afterwards, of course, he wrote all these great books and became known as the second Garab Dorje, or the second Buddha. The word ‘keep’ here means to make certain the teachings are not lost. ‘Maintain’ means to connect with, practice, and live the teachings. ‘Preserve’ means not to corrupt or alter the meaning of the teachings. ‘Spread’ means to disseminate the teachings. “Chain of Golden Mountains” Excerpted from an upcoming book by the Venerable Khenpo Rinpoches on The Life and Teachings of the Buddha. On January 1, 2017 during the annual PBC New Year’s Vajrasattva and Vajrakilaya Meditation Retreat in New York City, Ven. 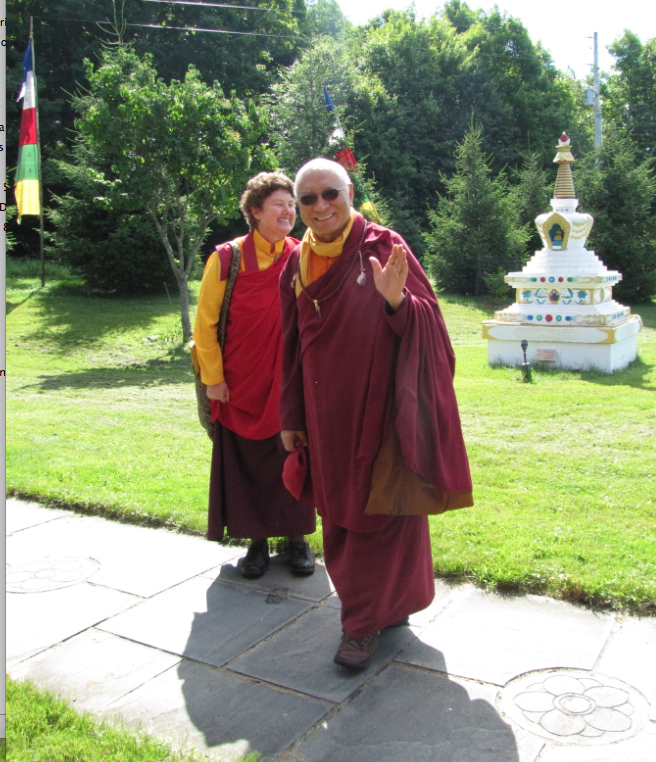 Khenpo Tsewang Dongyal Rinpoche gave numerous inspiring, pith instructions to the gathered Sangha. 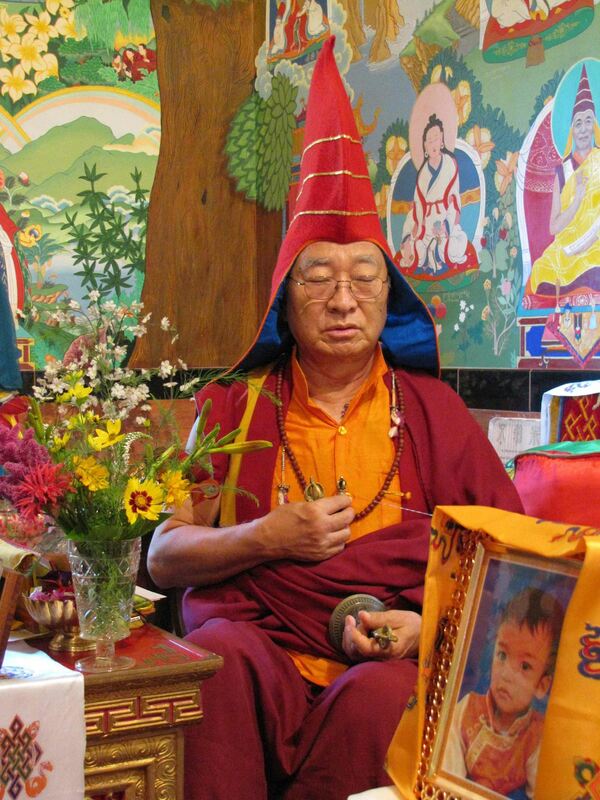 This brief teaching is on the incredible kindness of the Buddha and Guru Padmasambhava for teaching and spreading the Dharma, and for our tremendous fortune that these teachings are still available to be studied and practiced.